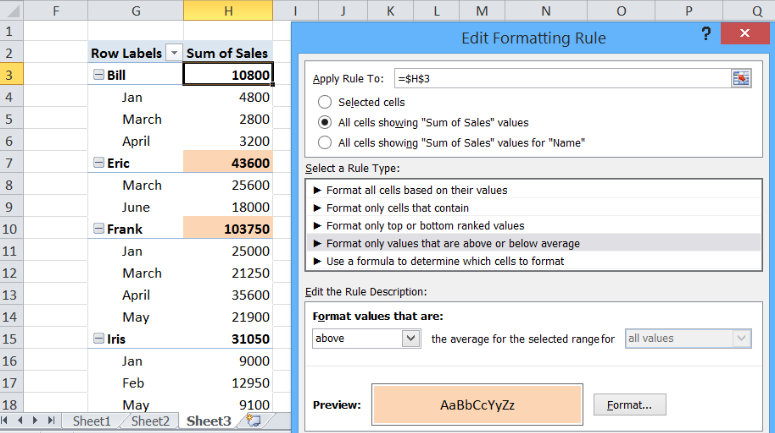 We often want to enhance the layout and format of our pivot tables by using Conditional Formatting. 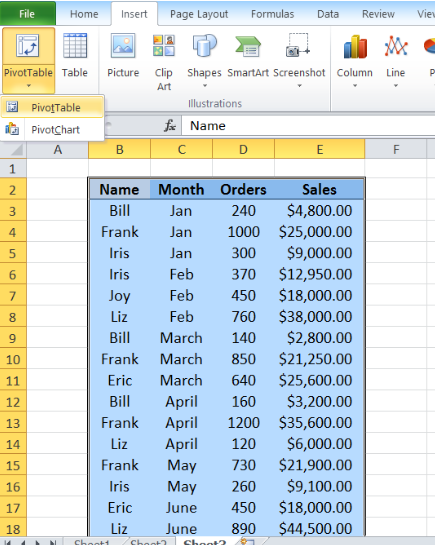 This step by step tutorial will assist all levels of Excel users in working with a pivot table that has conditional formatting, and learning to solve some common problems associated with it. 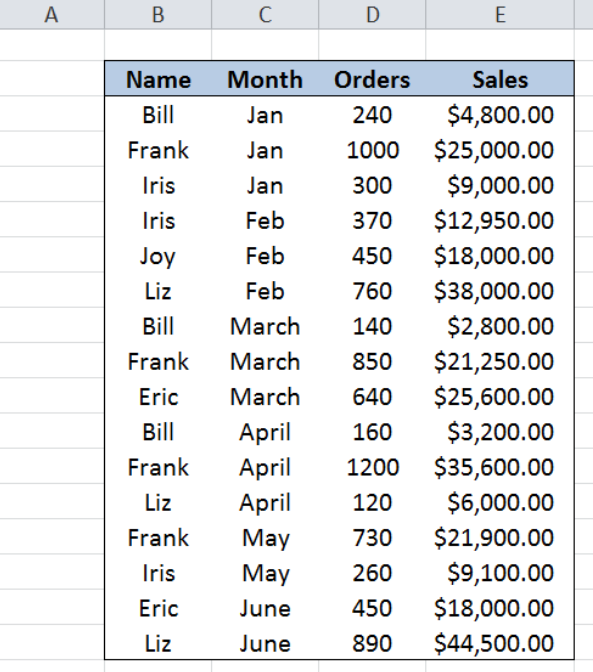 We want to highlight the sum of sales per month, but the highlighted cells are the subtotals per name as shown below in cells H7 and H10. Change the cell reference in the Apply Rule to: bar from $H$3 to $H$4 then tick All cells showing “Sum of Sales” values for “Month”. This way, the sum of values for each month that are above average are highlighted. 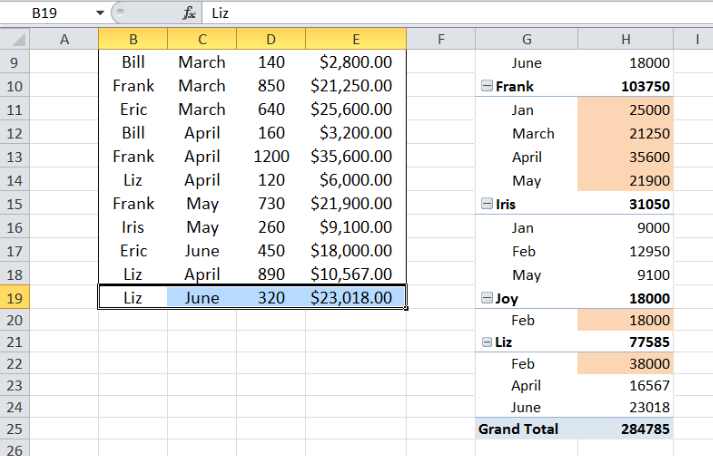 In below table, we have added new data in row 19 for Liz in June. 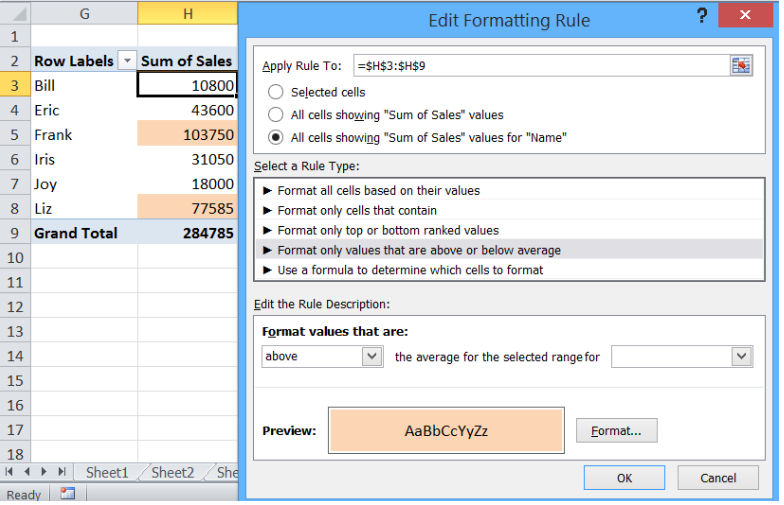 The pivot table has been updated but conditional formatting is not applied to the new data in G24:H24. The most probable cause would be the cell reference or range inside the Apply Rule To: bar. 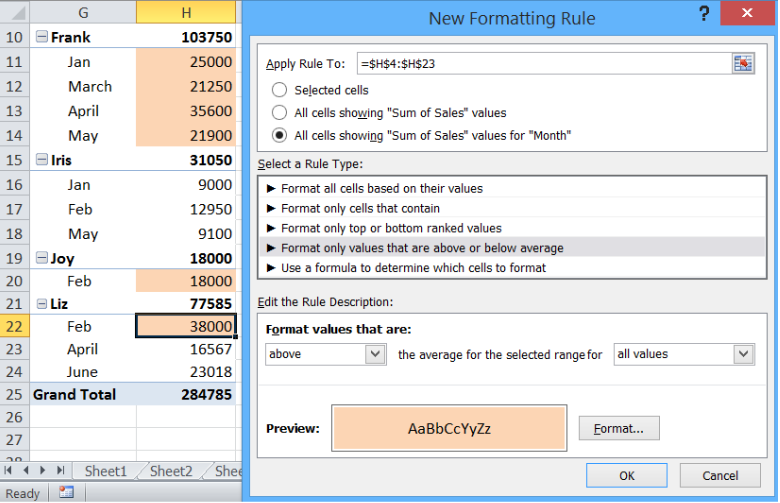 Change the formatting range from $H$3:$H$23 to $H$3:$H$24 to include the newly added data in conditional formatting. Sometimes we encounter this error when applying conditional formatting to our pivot table. 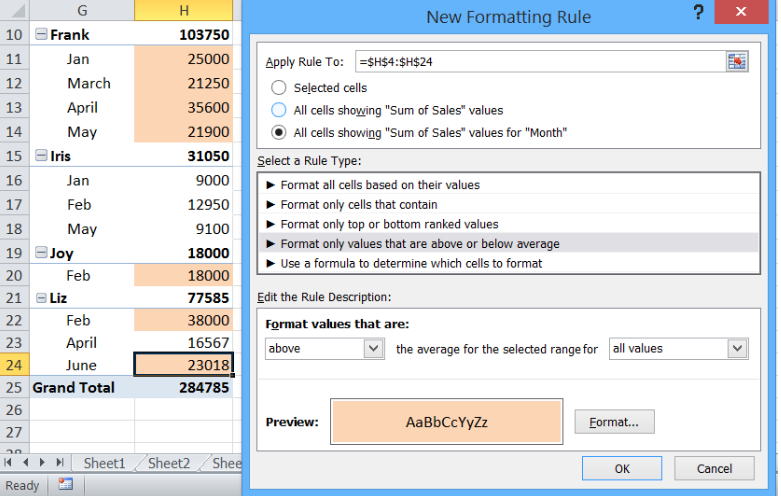 It says conditional formatting cannot be applied because the range has cells outside of a PivotTable data region. In cases like this, the Apply Rule To: contains an invalid range like the example below, where the range is: =$H$3+$H$10. 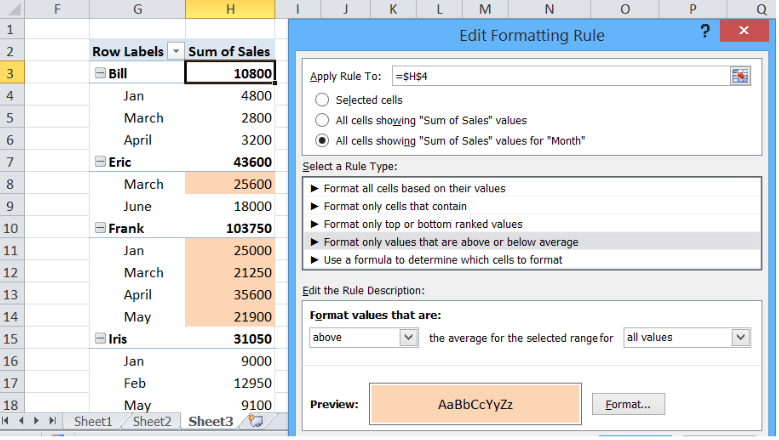 The conditional formatting now works perfectly and highlights the sum of sales above average.